When I interviewed Hay House author Dr Menis Yousry about Love, Relationships and Heartbreak, he raised a much bigger issue that I felt deserved its own little film. I’ve called it “#Face_Time”. Although it could just have easily been called “The Love Connection”, which I thought of just as I finished it!. (I think I’ll call the next project that title). I hope you find it a reflective, calming and heart-touching short film, especially at this time of year. Wishing you all a beautiful Christmas full of love (and enlightenment!). PS. I’m filming and curating videos of elderly people sharing their life lessons. Perhaps you could interview your parents or grandparents during the holidays – and capture their words of wisdom? 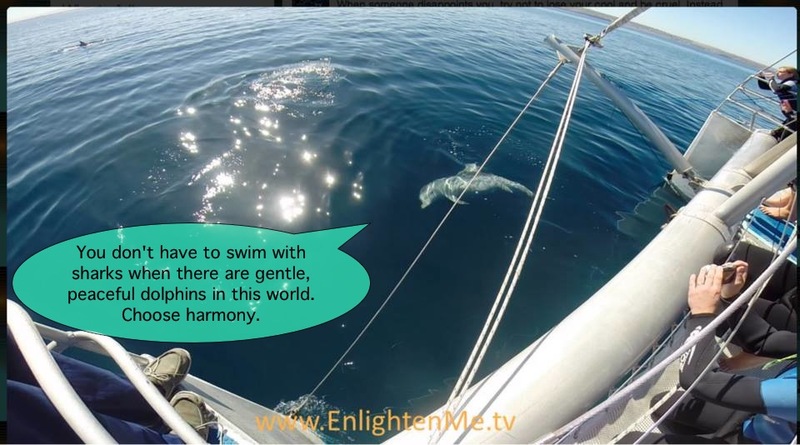 Here’s 2 minutes of Calm and sweet freedom for you… being swept along with Dolphins. Ever-smiling Dolphins represent peace, harmony… and playfulness! Notice how they swim in Pods. They are social creatures, and Bottle Nose dolphins like these are even known to be empathetic; cooperating together to rescue the sick. They have much to teach us. This is raw, uncut footage from the Great Barrier Reef, Queensland, Australia, kept long to really give you a feel for the experience. Can you Enlighten Me.. have you been swimming with dolphins? How was the experience for you? I’d love to read your comments below. A little snapshot from swimming with dolphins in my hometown Adelaide, South Australia a few weeks ago. Sending you virtual rays of sunshine, where-ever you are, who ever you are.